We all know most geeks aren’t really the outdoorsy type, right? 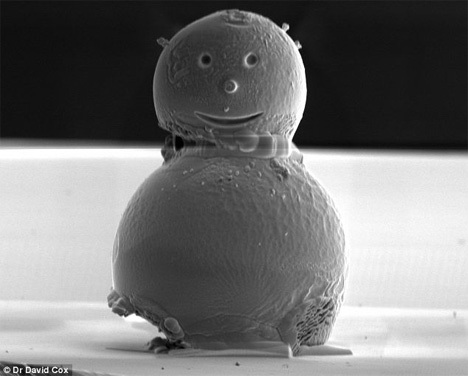 So it’s very fitting that scientists at the National Physical Laboratory built a microscopic snowman that you can’t even see with the naked eye. 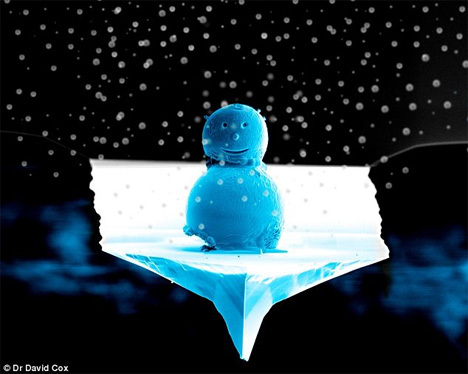 This happy little fellow was put together by Dr. David Cox of the Quantum Detection group at the laboratory. When cast in a blue light as it is above, it really does look like it could be a life-size snowman. But the itty-bitty snowman is only .001mm across, or about one-fifth the width of a human hair. Dr. Cox made it with two tiny tin beads that are usually used to calibrate electron microscope lenses. The pieces were welded together with tiny pieces of platinum, and a focused ion beam was used to carve the face and place the platinum nose. See more in Art of Tech or under Technology. December, 2009.